Roy Hodgson for Prime Minister! Well, I think we saw the man who would make an ideal Prime Minister on our tv screens last night. No, I don’t mean Dave, Nick or Gordon, but the wonderful Roy Hodgson, who has taken Fulham to a European final for the first time in their history. Hodgson is calm, intelligent, modest and very well-travelled. What a great job he’d do as PM. Failing that, what a great job he’d do as the next England manager. As I mentioned here, I’ve been a big fan of Hodgson since the early/mid 1990s when I was living in Switzerland and Hodgson was the manager of the national team. He got the Swiss to the World Cup finals of 1994, where they reached the round of 16, their best showing for forty years. At almost every club he’s been with, Hodgson has been a success. It’s great to see this most unassuming of men finally get the recognition he so richly deserves. 'Bigot-gate’? This is far more important, but has got far less media coverage. Motorists paying record prices at the pumps reacted with fury at news of a 135 per cent rise in profits by oil giant BP - earning a massive £463 a second. The 135 per cent profits rise comes after the price of crude oil was pushed higher by recovery hopes for the global economy and due to market speculation. For the first three months of the year it works out at at £40million a day, and £1.6million an hour and £2,777 a minute. BP: Bxxxxy Profiteers. And why isn't the rocketing price of petrol a major election issue? Neil Clark: If the Lib Dems force a coalition, every party could fragment- including Nick Clegg's. Imagine a British political landscape without a Labour or Conservative Party. Where there are several political parties, all with a realistic chance of making it into government. Where single-party administrations are a thing of the past and multi-party coalitions are the norm. Sounds far-fetched? It could happen much sooner than you think. If the Liberal Democrats do hold the balance of power in next week's general election, as the opinion polls predict, then Britain's antiquated first-past-the-post electoral system will be kicked into touch. But the adoption of proportional representation - the price the Lib Dems will demand for propping up a Tory or Labour government, whichever it turns out to be - won't only mean fairer elections in the future, it is also likely to lead to the radical transformation of our party system. And I mean radical. While supporters of first-past-the-post denounce the idea of peacetime coalition government as being horribly 'un-British', in one sense we've had coalitions for years. Both the Labour and Conservative parties are coalitions, made up of people holding a wide range of opinions, who only stay together due to electoral convenience. The Conservative Party includes socially liberal Europhiles such as Ken Clarke, and socially conservative EU-haters like Lord Tebbit. In today's Parliamentary Labour Party you can find the unequivocally anti-war socialist John McDonnell, and the darling of the right-wing media, Frank Field, a man who sits on the advisory board of the free market think-tank, Reform. What keeps our two 'broad church' main parties together is the knowledge that under first-past-the-post any breakaway party has little chance of getting into government, even if, like the SDP in the early 1980s, it is led by well-known political figures and attracts plenty of positive media coverage. But under PR all that will change. Political marriages of convenience will no longer be quite so convenient and, for some divorce will look a far more attractive option. A classic from today's Daily Telegraph. SIR – With the acquisition of Arriva (report, April 22) by Deutsche Bahn, which already owns or runs EWS (operator of the royal train), London Overground, Tyneside Metro, Wrexham & Shropshire and Chiltern Rail, it seems those that wish to see our trains returned to state ownership can start to celebrate. I would personally have preferred it had the state in question been Britain, but perhaps we can at least look forward to improved efficiency on Arriva services. He was the best manager Hull City had ever had. He saved them from relegation to League One (the old Third Division) and then, incredibly, took them to the top flight of English football for the first time in their history- where even more incredibly they reached the top three in the first half of the season. This season, despite a tough run of fixtures at the turn of the year, Phil Brown’s Hull had still managed to beat Man City and hold Chelsea. But after a last gasp defeat at home to Arsenal in March, Brown was sacked. At the time, Hull were by no means relegation certainties. His successor, Iain Dowie, a man who has flopped at most clubs he’s been with, won just one game out of nine (against a Fulham team going through the motions) and on Saturday- after their third successive home defeat, Hull were relegated. I don’t know about you, but I can’t think of a worse decision in English football this year than the sacking of Phil Brown and his replacement by Iain Dowie. And guess what, Brown may return as Hull manager. It’s a bit late now, Mr Pearson. It was arguably the biggest war crime committed against a civilian media institution and its workers in history. Exactly 11 years ago today, on 23rd April 1999, NATO bombed Serbian Television (RTS), murdering 16 innocent people. British Minister, Clare Short claimed RTS, a station that regularly broadcast repeats of Only Fools and Horses, but which committed the ‘crime’ of challenging NATO's propaganda during the bombing of Yugoslavia in 1999, was a ‘legitimate target’. The bombing as well as being an appalling war crime, set a terrible precedent. Not only have those who ordered and carried this blatant war crime got off scot-free, but the puppet government in Belgrade, which came to power after the illegal US-sponsored coup d‘etat against President Milosevic and the Serbian Socialist Party in October 2000, put the RTS director Dragoljub Milanovic on trial and sentenced him to ten years imprisonment. Milanovic, a political prisoner if ever there was one, remains in prison to this day. He was effectively the 17th victim of the bombing- with his imprisonment a warning to all others who might have the temerity to run a media outlet which dares to challenge the lies of the most powerful military alliance in the world. Here are the names of the sixteen innocent civilians murdered by NATO on 23rd April 1999. You will see that eleven of those killed were under 35 years of age. May they all rest in peace, and let us hope that some day those responsible for their deaths will finally face justice. Britain’s neoliberal political elite oppose the British state owning railways and buses in Britain, but it seems they’re perfectly happy for the German state to own them! Here’s my article from The First Post on this ludicrous state of affairs. When the sell-off of Britain's state-owned companies started in the early 1980s we were told it would be much better for publicly-owned assets to be transferred to the private sector. State ownership was bad and inherently inefficient, private ownership was good. That was the Thatcherite mantra. Thirty years on, however, large sections of our economy are back in state hands - only it's not the British state that's the owner, it's the governments of other European countries. Today's £1.59bn takeover of the bus and rail firm Arriva, Britain's second largest transport provider, by Deutsche Bahn, which is 100 per cent owned by the German government, is just the latest in a series of deals in which publicly-owned European companies have taken over privatised British companies, or firms running services previously operated by the British state. 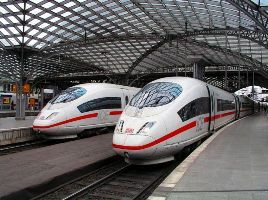 Even before today's transaction, Deutsche Bahn already owned Britain's largest rail freight company (which operates the Royal Train) and Chiltern Railways: in addition they have a 50 per cent stake in London Overground and the Wrexham, Shropshire and Marylebone Railway and, since April 1, have also run Tyne and Wear Metro. It's not just the Germans who are operating British trains: the Netherlands' state-owned railway, NS, is a joint owner of Northern Rail and Merseyrail. France's state-owned railway SNCF, who missed out on Arriva, are keen to enter the UK transport market too. As for British utilities, EDF Energy, a subsidiary of the French state-owned EDF, supplies 5.5m customers in the UK. Last year, EDF Energy also took control of the privatised British Energy, the UK's largest electricity generator and operator of Britain's nuclear power stations. The German state running trains in Wales? The French Government providing your gas and electricity? Such a prospect would have seemed incredible in the mixed economy Britain of 40 years ago, but it's the reality of life in the 'everything is for sale' Britain of today. The gap between the richest and the poorest in London is wider than it has been since the days of slavery, a leading academic said today. The City elite and the wealthy in the capital enjoy the greatest advantage over the poorest that has been known in 200 years, Professor Danny Dorling said. And in the rest of the country the difference between the best and worst off is as big as it was in the slump years of the 1920s when mass unemployment led to poverty without a welfare state safety net. In an interview yesterday, Professor Dorling, of Sheffield University, said the top 10 per cent of people living in London have on average wealth worth £933,563, while the poorest 10 per cent are on average worth £3,420 - some 273 times less. And what a shocking indictment of thirteen years of ‘New Labour’ government. Jacking up prices to make an even greater profit from people’s hardship is one of the most inhumane elements of modern neoliberalism. While the closure of Europe’s skies has been terrible news for stranded travellers, for some greedy companies, it‘s been a chance to make a quick buck. Stranded Britons last night told how they had been held to ransom as they battled to get home. Travellers returning through English ports complained of being forced to pay exorbitant fees for car hire, hotels and train fares. Mr Hancock, 51, and wife Karen, 49, were in southern Italy when their Flybe flight to Birmingham was cancelled last Thursday. On Saturday, we tried to hire a car. Europcar said we could return a rental to Germany. But we had to pay 570 euros (£501) to drive their car back to Frankfurt. From there we got trains to Paris, Lille and Calais. Eurostar is charging £223 for a single train ticket from Paris to London over the next two days, more than three times the £69 for a similar journey in two weeks’ time. Don’t you just love ‘market-based’ pricing? It doesn’t have to be like this. When asked to name his ‘Grand National Legend’ in this year’s Grand National race card, the jockey Mick Fitzgerald, didn’t name a horse or a fellow jockey- but ‘the people of Liverpool'. ‘I would love to nominate the people of Liverpool as legends for opening their doors to the world the year the National was put back to the Monday (because of a bomb scare) in 1997. I am confident it would not have been possible in any other city, for the people of Liverpool were amazing. They opened their doors to everybody- pauper, jockey, trainer, all were welcome- and it made restaging he race on Monday a possibility'. By 1997, the people of Liverpool had already had to put up with 18 years of selfish neoliberalism- which they‘d never voted for. But by opening their doors to all- comers, and helping those stranded in the city, people like the wonderful ‘Auntie’ Edie Roche, showed that they rejected the tenets of a heartless creed that says that profits should always come before people. Nick Clegg: How far can he-or his party- go? This piece of mine appears in today’s First Post. A week is a long time in politics, Harold Wilson once famously remarked. After the dramatic impact of last Thursday's live television debate between the three main party leaders, we can say that the late Labour Prime Minister was far too cautious in his judgment. One night is enough. Before the debate, Liberal Democrat leader Nick Clegg was the clear third choice of the British electorate. Now he is a man rivalling Winston Churchill in the popularity stakes, with his party having the most popular support in a general election campaign for the first time since the year of the Great San Francisco Earthquake and the launching of the Lusitania. The question is: how far can the man of the moment - and his party - go? Could we actually be on the brink of seeing Liberals holding Cabinet posts in a peace-time government in Britain for the first time since the days of the national government of the 1930s - or even be about to witness the first government led by a Liberal politician since 1922? Rather like the non-barking dog in Sir Arthur Conan Doyle's classic detective story Silver Blaze, the most curious incident regarding our three main parties manifesto promises on Britain's railways is not what they have said, but what they haven't said. The Labour Party boasts of its commitment to "a new high-speed rail line linking North and South" and says it will "press ahead with a major investment programme in existing rail services." Labour will "encourage more people to switch to rail" and promises to "treble the number of secure cycle storage spaces at rail stations." The Tories pledge to "reform our railways to provide a better focus on tackling problems that matter most to passengers, like overcrowding." They will "grant longer, more flexible franchises to incentivise private sector investment in improvements like longer trains and better stations." The Lib Dems, meanwhile, promise a "rail renaissance, reopening closed railway lines and new stations and building a high-speed network to cut journey times to Scotland and the north of England." Have you spotted something? Not one of our three major parties mentions the single most important measure that would improve our fragmented, unreliable and ludicrously expensive railway network - taking the entire network back into public ownership. Seeing that over 70 per cent of the public want to bring back British Rail, you would have thought that at least one of our three leading parties would advocate such a measure. But in the same way that the non-barking dog revealed to Sherlock Holmes the solution to the mystery of Silver Blaze, so the parties' reluctance to even discuss renationalisation reveals to us the sordid truth about British "democracy." Namely, that it isn't the people who decide what gets into party manifestos, but capital. The difference between how a publicly owned transport system and a privately owned one operates was graphically illustrated to my family and I on a recent journey back from Austria. We were staying for a few days in a little town in the Alps. We took a train from the town to Salzburg's main railway station. The journey lasted two-and-three-quarter hours and cost just over 9 euros (£7.90) each. The train had plenty of free seats and we had legroom which seemed to be almost double the size of that we get on trains back home in Britain. We then took a bus from Salzburg railway station to Salzburg airport, a 20-minute ride which cost 2 euros (£1.75) each. The train was punctual to the second, as was the bus. Indeed, in all my journeys in Austria down the years I have never known a train or bus to be late, despite them sometimes having to deal with atrocious winter weather conditions. How different to the way transport operates in privatised Britain. On arriving back at our British airport, we were informed that the National Express coach to take us home would not be arriving as it had broken down. We, along with the other passengers, had to wait another 25 minutes before another coach, picked us up to take us to Luton airport, from where we had to change to get on yet another coach. Almost every time I or a family member travels with National Express, something likes this happens. How is that Austria's State Railways and the country's Postbuses can operate so efficiently, while National Express is so dreadful? Neoliberals love to claim that anything run by the state is inefficient and anything privately run is efficient. In fact very often the opposite is true. What makes the National Express travel experience even more galling is the knowledge that the company has received around £2.5bn in taxpayers' subsidies over the past 10 years - and it pays us back with such an appalling service. As RMT general secretary Bob Crow says, National Express has been taking us all for a ride - though not a very punctual or comfortable one. Things could get even worse. Thatcherite fanatics in the EU Commission seem hell-bent on destroying Europe's excellent public transport and in the name of "increasing competition" force through, against the public's wishes, the privatisation of railway and bus services. The prospect of rip-off, inefficient British companies like National Express running trains and buses in Austria at some time in the future is a truly appalling one. It falls to us to build a pan-European pro-public ownership movement to make sure it never happens. Hungary's state-owned railway MAV has had a tough time of it in the past few years. Starved of investment by the country's faux-left, ultra-Blairite government, around 10 per cent of lines have been closed and ticket prices have risen sharply. But despite the very welcome defeat of Hungary's corrupt, serial-privatising and pro-war "Socialists" at the weekend, worse could be to come not just for MAV but for Hungary's long-suffering people. Ninety-three heirs of Hungarian Holocaust survivors have filed a lawsuit at a Chicago court against MAV for $240 million damages and $1 billion non-asset compensation. They claim that MAV had provided its carriages being fully aware that these would be used to transport 437,000 Jews to the gas chambers in Auschwitz in 1944 and accused the company of looting their ancestors' possessions. The case is due to be heard on April 22. The Holocaust was an unspeakably heinous crime, but is it right that in 2010 Hungary's railways should be held responsible for the atrocities of Hungary's pro-nazi collaborationist government nearly 70 years ago? If the lawsuit succeeds it will not only mean the end of MAV and job losses for its 20,000 employees, but, as the railway is in public hands, even more hardship for ordinary Hungarians, who are reeling after years of cutbacks in health care, pensions and welfare provision. With poverty and malnutrition rising in Hungary, the cuts in public spending which would follow the success of the lawsuit would inevitably lead to the premature deaths of innocent people who had nothing whatsoever to do with the horrible events of World War II. It's good to hear that Jewish community leader Peter Feldmajer has criticised the lawsuit, saying: "No legal action can be brought against MAV on moral grounds." Even if it does win the case, cash-strapped MAV has resigned itself to spending up to 45m forints (around £150,000) on legal fees to defend itself against the lawsuit. Hopefully common sense will prevail and, instead of facing closure or more cutbacks, Hungary's state railway will win the case and get a better deal from the country's new leadership. This blog post also appears at the New Statesman. Is Britain heading back to the toxic mix of politics and business seen in the 1970s?, asks Kamal Ahmed in the Daily Telegraph. Not since the 1970s has there been such an "anti-business" mood in politics and among the general public. This is the first election since that blighted decade when talk of "fat cats" and "taxing wealth" are legitimate election issues. Some might say "What do you expect? ", but I think we may come to regret an over-correction following the events of the autumn of 2008. If only it was true that Britain was heading back to the 1970s! If Ahmed was right, we’d expect to see at least one of our main parties advocate the extension of public ownership. Instead all three promise even more privatisation. We'd also expect to see calls for new Wealth Tax and for the top rate of tax to be far more than 50%. Far from being a ‘blighted’ decade, the 70s marked the zenith of progressive politics, as I argued here. Not only that but the decade gave us the best television comedies (think Dad’s Army, Fawlty Towers, The Good Life, Rising Damp and The Fall and Rise of Reginald Perrin), the best tv drama (think Upstairs Downstairs, The Onedin Line, When the Boat Comes In, and Lillie), and the best football, (think Brazil in the 1970 World Cup, Holland in 1974 and Argentina in 1978). It was a great decade and we even had the heroics of Red Rum too. But neoliberals like Kamal Ahmed hate the 1970s because capital was not in complete control. Half the world had ditched capitalism all together, while most countries outside of the communist bloc operated a truly mixed economy, where the interests of ordinary people came before the interests of multinationals and Goldman Sachs. The task facing true progressives today is not to turn the clock further forward, but to turn it back- to a decade when things were immeasurably better for the majority of people on the planet than they are today. Are we really happy to say that we'd give up our independent nuclear deterrent when we don't know what is going to happen with Iran, we can't be certain of the future in China? China?? Does David Cameron really believe that the People's Republic of China is a threat to the United Kingdom? That the Chinese, in the midst of supplying our high-street stores with much of their clothing lines, have prepared military plans to either invade and occupy the British Isles or nuke us to smithereens from afar? Germany's defence minister visited the 4,500-strong Bundeswehr contingent in Afghanistan as a new poll indicated that almost two out of three Germans want its military brought home. Karl-Theodor zu Guttenberg toured German military headquarters in Mazar-i-Sharif before heading to Kunduz, where German troops mistakenly shot dead six Afghan soldiers on April 2 following a guerilla ambush in which three Bundeswehr personnel were killed. Berlin's military intervention in the impoverished country is deeply unpopular among German voters. Stern magazine has published a Forsa poll which found that 62 per cent of the 1,004 people surveyed want the troops withdrawn. That is a considerable jump from September 2005, when only 34 per cent of those polled by Forsa said the Bundeswehr soldiers should pull out. Washington is increasingly concerned over declining support in Europe for the war. Well, Washington certainly has no grounds for concern in the forthcoming General Election in One-Party Britain. All three of our main parties- including the 'progressive' Lib Dems, support continued British involvement in this costly and unwinnable war. Lorna Fitzsimons was right- in Britain, foreign policy is an ‘elite’ issue. What ordinary people want doesn’t come in to it. Sadly, it seems that's the case in Germany too. It’s exactly 45 years this spring since the release of the film version of The Sound of Music. Here’s my appreciation piece from the Sunday Express. It's the film, which, in the words of critic Leonard Maltin has “pleased more people than practically any other film in history”. The Sound of Music, released 45 years ago this spring, is not just a film, it’s a global phenomenon. Sound of Music “flash mobs” have danced to such songs as Do-Re-Mi in railway stations as far apart as Antwerp in Belgium and Wellington in New Zealand. Sound of Music sing-alongs, where members of the public, often wearing nuns’ habits and wimples, attend screenings, are sell-outs. In Salzburg, Austria, you can go on tours visiting the film locations. Over the past 45 years, millions of us have bought the film on video and DVD, and millions more watch when it is broadcast on television. Nearly half a century on from its release, the film’s popularity continues to grow. So how can we explain its extraordinarily enduring appeal? First, there are the fantastic tunes. The composers, Richard Rodgers and Oscar Hammerstein, were among the most talented songwriters of the 20th century. They not only wrote the Sound of Music but other classics including the King And I, South Pacific, Oklahoma! and Carousel. They penned songs that touched every human emotion. You’d have to be made of stone not to be moved by Climb ev’ry Mountain or charmed by Sixteen going on Seventeen. Then there’s the great performances. Julie Andrews, the girl from Walton-on-Thames, Surrey, was unforgettable as Maria, the high-spirited novice who decides to leave her life in the convent to become a governess for the von Trapp family. Canadian Christopher Plummer was perfectly cast as Captain von Trapp, a disciplinarian who possessed enormous masculine charm. Richard Haydn was memorable as impresario Max Detweiler, while Eleanor Parker made a glamorous Baroness. The children, headed by Charmian Carr as Liesl, were also magnificent. Then there’s the way the film showcased the fantastic mountain scenery of Austria, surely one of the most beautiful countries on the planet. Above all , though, there is the totally uncynical, joyous nature of the film. The Sound of Music was a product of its time: the sixties. It was an optimistic, upbeat age, where anything seemed possible. Post-war austerity had ended, the economic situation was improving rapidly and life, free of the stresses of the past, was there to be enjoyed. Was 'VIP passenger syndrome' to blame for Polish air tragedy? Amid the many theories still swirling around the Smolensk air crash in which Polish President Lech Kaczynski and 95 others died on Saturday, one is gaining ground: that the crash was the result of 'VIP passenger syndrome' and that the VIP responsible was the president himself. 'VIP passenger syndrome' means simply that a very important passenger uses his or her clout to influence the pilot and/or crew to make a bad decision under pressure. Fingers are being pointed at the late president after it was disclosed that he had done something like it before. In August 2008, Kaczynski reportedly "shouted furiously" at a pilot who, for safety reasons, disobeyed an order to land his plane in Tbilisi during Georgia's war with Russia (Kaczynski was a great supporter of the Georgian president, Mikheil Saakashvili). Kaczynski later tried to have the Polish air force pilot, Grzegorz Pietuczak, removed from his job for insubordination, but Donald Tusk, the Polish prime minister intervened. Capt Pietuczak was later given a medal for carrying out his duties conscientiously, despite the presidential pressure to ignore the risks. Russian aviation experts looking into Saturday's crash are convinced the same thing happened again and this time the captain, Arkadiusz Protasiuk, another Polish air force pilot, bowed to the presidential command. More on this story over at The First Post. Well, I was down on my bets on the race overall- despite an each-way return on third-placed State of Play - but who cares after such a memorable outcome. It was great just to be at Aintree to witness what the Racing Post has described as ‘the defining moment of a legend’. 14 times champion jockey Tony McCoy had tried to win the Grand National- 14 times he’d failed, often in the most unfortunate of circumstances (just think back to him being carried out by a loose horse when cantering on Clan Royal at second Becher’s in 2005). Yesterday, it finally all came right for the greatest jump jockey the sport has ever seen. Camaraderie has disappeared from much of our society, but it still exists, as I argued here, in the jockeys' weighing room, as the generous tributes paid to McCoy after the race by his rivals shows. And let's not forget Don't Push It's trainer Jonjo O'Neill, one of the nicest men in any sport, and who was also celebrating his first ever Grand National success. Well, that’s enough about Britain’s Tweedledum v Tweedledee General Election, now let’s focus on a much more meaningful and interesting contest: tomorrow‘s Grand National. Chris H has asked me if I have any tips for tomorrow’s race. Well, here’s my Punter’s Guide to all 40 runners from today’s First Post. I hope it might help you make a bit of money. The very best of luck with whichever horses you decide to back. And let’s hope all the runners and riders come back safely. Even though the first winner of the Grand National, back in 1839, was called 'Lottery', the world's most famous steeplechase is not quite the totally random event many believe it to be. Last year's winner, Mon Mome, may have been a 100-1 shot, but he had solid form and should really have started at around a quarter of those odds. Finding the National winner is never easy, but by focusing on some key race trends we can prune the field of 40 down to a more manageable shortlist. First, concentrate on horses aged between eight and 12. No seven-year-old has won the race since the year Hitler invaded France, no 13-year-old since 1923. Then look for a horse carrying 11st 1lb or lower - no horse has carried more to victory since Corbiere in 1983. Even though the fearsome National fences have been modified in recent years, the race, run over the extreme distance of 4m 4f, is still a severe test of stamina, and special attention should be paid to horses who have won, or run well in other top staying chases, such as the Scottish, Welsh and Irish Nationals. Finally, when it comes to Aintree, there's no form like course form. Five of the last seven Grand National winners had safely completed a race over the course on a previous occasion, including last year's winner, Mon Mome. MADISON DE BERLAIS ** Classy performer but has it all to do off top weight. MON MOME *** Last year's winner looks sure to run well again, but carrying 7lb more this time may scupper his chances of a repeat. BLACK APALACHI *** In the lead when unseating his rider at second Becher's last year; good each-way chance if putting in a clear round. JOE LIVELY * Veteran who is not so lively these days and is better suited to Cheltenham. VIC VENTURI **** Irish raider who has never fallen and who won over the Aintree fences in November. Solid chance of at least making the frame. COMPLY OR DIE *** Winner in 2008, and runner-up last year, the Aintree specialist has a good chance of another first-four finish. You can read the rest of my Punter’s Guide to all 40 runners in tomorrow’s race, here. Neil Clark: There’s nothing between the parties when it comes to key policies. It promises to be the most exciting contest for years - one where at least a dozen different outcomes are possible. But that's enough about Saturday's Grand National. What about the General Election? Over the next few weeks, we can expect to be bombarded by media pundits and politicians telling us how 'significant' the coming poll will be - why the election will be the 'most important' since the war and why we all need to get out and vote. Don't believe a word of it. For the sad truth is that the vote on May 6 will be the most meaningless poll in modern British political history. In a country which takes great pride in its 'democratic' credentials, and which sees its divine mission as spreading 'democracy' across the globe, the British voter will be presented with a choice of three main parties advocating almost identical policies on the most important issues of the day. All three have promised major cuts in public spending if they gain power in the election. All embrace globalisation, Thatcherite neo-liberalism and free trade and are in favour of maintaining an open economy, where historic British companies such as Cadbury's can be easily taken over by foreign predators, with disastrous consequences for British jobs. In foreign policy, all support continuation of Britain's costly involvement in the war in Afghanistan and the continuation of the transatlantic alliance. All take it as a given that Britain should play a prominent role in world affairs. All support Britain's membership of NATO and the EU. What the public thinks doesn't come in to it. Around 70 per cent of voters would like to see Britain's fragmented and ludicrously expensive railways re-nationalised. Yet neither Labour, the Conservatives nor the Lib Dems advocate such a measure. (The latter did in 2005, but the policy has since been quietly dropped). Despite the obvious failings of privatisation, nationalisation is still the great 'no no' for Britain's political elite - except of course when it comes to using taxpayers' money to bail out failing banks. On law and order, the parties are also out of step with the public. If Britain really were a properly functioning democracy, then we could at least expect one, or even two, of our three main parties to support the restoration of capital punishment for murder - a measure consistently supported by a majority of voters. But like the re-nationalisation of the railways, this an issue which is not even deemed worthy of discussion by the political elite. Murder in Budapest: Was it another Mossad hit? Back in the early 1990s, ITV filmed its detective series Maigret not in Paris, where George Simenon's famous novels are set, but in Budapest, regarded as a dead ringer for 1950s Paris and a place where production costs were much lower. It's a shame the pipe-smoking inspector is no longer walking the streets of the Hungarian capital, as his skills might have been of great help in solving a baffling murder case that has led to speculation from the US to the Middle East. On Wednesday March 17, just after seven in the morning, Dr Bassam Trache, a 52-year-old veterinary surgeon with dual Syrian and Hungarian citizenship, was shot dead in his black Mercedes at a junction in Budapest's 16th district. The killer grabbed a black briefcase from the car and made off on foot. Dr Trache, it was revealed, operated a money-changing business. A few years ago he was acquitted in court of attempting to bribe - with jewellery and Arab cakes - the head of the Budapest police's money-changing investigation division. At first, his murder was regarded as yet another killing connected with the shady world of money-changing; in the past ten years, there have been no fewer than 123 murders connected with the business in Budapest. But then a more fantastic theory to explain Dr Trache's murder emerged. It transpired that on the very day that Trache was killed, two Israeli Gulfstream V-type jets were spotted flying low over the Hungarian capital, leading to speculation that, just two months after the assassination in Dubai of Hamas commander Mahmoud al-Mabhouh, the Syrian might have been the victim of a Mossad hit.